"Strain explores the workings of representation, authenticity, knowledge, and experience within what the author terms the 'tourist gaze.' This way of knowing about peoples and places entails a process of selection-'the filtering eye'-and a search for authenticity. . . . The discussion of how today's popular culture (often recycling colonial tropes) predisposes our perceptions is particularly well argued and documented. Recommended. "-Choice "Public Places, Private Journeys provides a detailed and nuanced account of immersive technologies from the stereograph to virtual reality, conjoining these technologies with tourism, anthropology, and mass entertainment. In identifying the common narrative strategies by which modernity defines itself against an exotic other, Public Places, Private Journeys is an exemplary and erudite model of interdisciplinary scholarship. "-Chon A. Noriega, UCLA Department of Film, Television and Digital Media In this globally interconnected planet, we are increasingly able to access exotic locales without ever actually seeing these places firsthand. Instead, what we perceive to be fresh cultural experiences are actually secondhand moments, filtered through mediums such as television, film, the internet, CD-Roms, and various other media. Ellen Strain posits that the images in film and popular culture not only fill in the gaps of a person's firsthand-or rather, lack of firsthand-experience with other cultural situations, but also predisposes the "tourist gaze" to view particular locales in a predetermined way. How, she asks, are our perceptions of places and peoples created in the first place? Can a set of images-such as postcards-construct our vision of distant geographies? Are there culturally constructed strategies set up to mediate our cross-cultural perceptions of the exotic? Strain includes the works of Jules Verne, E. M. Forster, and Michael Crichton, as well as film, CD-Rom travel games, and virtual reality in her own authorial gaze. 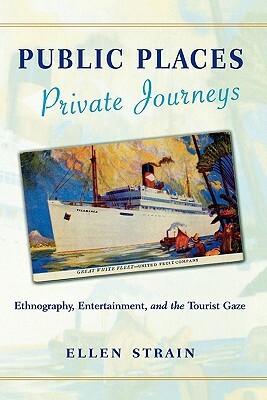 Public Places, Private Journeys is a unique postmodern exploration of how individuals see across cultural differences in an era of increasingly commercialized and globalized culture. Ellen Strain is an assistant professor of film and multimedia in the School of Literature, Communication, and Culture at the Georgia Institute of Technology.